It's nothing like a conventional DAW, but with its different way of working, Renoise 3 could change your music-making life. The best tracker on the planet. Sampler more powerful than ever. Full of native DSP and Meta devices. Versatile parameter control. Great price. Limited time stretching options. Interface can be overwhelming at first. 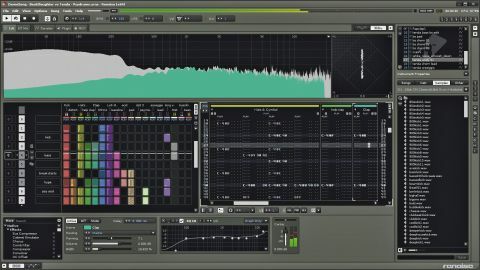 When we reviewed Renoise 2 in early 2009, it was already a solid package, and there have been no shortage of mould-breaking point releases since then, delivering enough significant features to more than justify Renoise's intriguing license fee system. You see, when you shell out for a Renoise license, it's valid for a whole version number; so if you buy at v2.6, you'll get everything up to and including v3.6. The 2.x additions have included the now- essential Pattern Matrix with its powerful pattern aliasing, Groups for nesting tracks up to six layers deep, Sample Slicing for quickly hacking up loops, Lua scripting for building custom Tools, and a ton of native DSPs (effects) and Meta devices (see Ultimate control). Since v2.8, Renoise has also been available in both 32-and 64-bit builds, along with it's own built-in plugin bridge which lets 32-bit plugins run in the 64-bit version and vice versa. Renoise 3, then. First and most obviously, the GUI has been completely rebuilt and now supports panel resizing and collapsing. The sampler, plugin hosting (VST/AU/LADSPA/DSSI) and MIDI controls have all been combined in the new Instrument Editor, which can be detached for viewing on a second monitor - we'd like to see this added to the Mixer, too. "The Instrument Editor is where the most profound changes to Renoise 3 have been made"
The Instrument Editor is where the most profound changes to Renoise 3 have been made, particularly with regard to the Sampler. The old sample envelopes have been ditched in favour of Modulation Sets, which control the same five basic parameters as before (volume, panning, pitch, cutoff and resonance), but with the ability to combine multiple modulation devices (LFOs, envelopes, key and velocity tracking, etc) like building blocks, yielding gratifyingly complex and intricate results. In addition to this, samples can be assigned to one or more Effects Chains within the Instrument Editor, rather than only sent through track effects (as in previous versions), for the construction of self-contained instrument/effects chains and combinations, drawing on plugin effects and Renoise's vast bank of native DSPs (effects) and Meta devices. These chains and combinations can either be used in isolation or routed into one another. The power of this exponentially increases when using multisampled instruments, as not only can each sample be assigned to its own Effects Chain and Modulation Set, but automatable, MIDI-assignable Macros can simultaneously control multiple parameters on any number of devices, opening up endless sound-animating possibilities. Note that much of this sample-mangling power will soon be available for any DAW as a VST/AU called Redux. Essentially an entire Renoise instrument in a plugin, it will include DSP effects, meta devices, the new Modulations and Effects Chains and even the Phrase editor. The new Phrase Editor is essentially a mini tracker-in-tracker for assigning (polyphonic) rhythms and melodic phrases to individual instruments, which are then triggered from the main Pattern Editor. "There's a new Pattern Command, called MaYbe, which dictates the probability of a note playing"
This already-excellent feature really comes into its own when used in tandem with Pattern Commands in the main sequencer, enabling you to reverse, slice and perform tricks with this note information as a whole, just as you would with instruments outside the Phrase Editor. There's a new Pattern Command, too, called MaYbe, which dictates the probability of a note playing. And it's now possible to have Renoise pseudo-generatively construct patterns for you by selecting one note per line from a selection, based on user-specified probability, so you can loop whole sections of music and get a different melodic and/or rhythmic result with each cycle. Multisampling gets more 'realistic' in v3, with Keyzones supporting round-robin samples in Cycle and Random mode, and samples being assignable to Mute Groups - for cutting off open hi-hat sounds with closed ones, for example. All of this ups the potential for both more realistic 'live' instruments and more interesting electronic ones. While Renoise doesn't do anything to challenge the notion that the regimented, grid-based approach of the tracker is better suited to electronic than 'live' music production, it is without doubt the most powerful tracker in existence, with an impressive roster of well- implemented, often unique features. Since we've only covered the major changes since v2.8 here, we should also point out that Renoise 3 is an enormous upgrade from Renoise 2.0. All in all, it's a fresh, viable and very stable option for anyone looking to replace or accompany (via ReWire) their current conventional DAW at an unquestionably good price.